How did the Aquarius mission begin? The mission officially started about ten years ago. The PI (Principal Investigator) has been working on Aquarius for about twenty years. I got involved in the late nineties. A lot of us have been working on Aquarius for a long time. Officially, the mission started in 2002. The aircraft program (to develop the instruments) began well before the satellite program in the late '90s. Yi Chao, Aquarius Project Scientist, NASA Jet Propulsion Laboratory in Ocean Bights Interview with Yi Chao, The Magazine of the Catalina Marine Society (CMS), Vol. 2, No. 2 (Interviewer: Chris Howell). I think it's amazing how it is possible to determine the salinity of water all over the world accurately with all the other "errors" that can affect it. How difficult was it to develop this method to determine the salinity of water in the ocean? The theory was developed more than 20 years ago. Because this is such a challenging measurement, it took more than a decade to demonstrate that we can do this. We did the lab test first, then build a water pool outside, and fly the aircraft to measure salinity in the coastal ocean, Now we believe that we are ready and can do it. Yi Chao, Aquarius Project Scientist, NASA Jet Propulsion Laboratory in Inspire Chat with Yi Chao (Host: Jim Gerard). 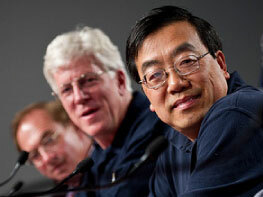 How does an oceanographer (such as Yi Chao) come to be involved with an organization like NASA? I received my Bachelor's degree from China in atmospheric physics and came to the United States for graduate school in 1985. I went to Princeton to study atmosphere/ocean sciences. After two years, having received my master's degree, I became more and more interested in the ocean, so I switched from atmospheric science to ocean science, which is very similar. They're both in the Earth/science, geo/science category. I got my Ph.D. in Oceanography, and then I came to UCLA as a post-doc, and began to interact with the people at JPL. I became fascinated with remote sensing techniques from aircraft and space, and after three years, I moved to JPL. I started my first job here in '93. My main interest is studying ocean processes and phenomena. I try to ask the question why does the ocean do this, how does ocean health affect the ecosystem, atmospheric processes and climate? JPL is working with a lot of engineers who try to think about future ways of measuring the ocean from space. It evolved from sea-level measurements in the nineties, wind-level measurements in the late nineties, and then ocean salinity being the natural course of study. Salt controls the weight of the water. More importantly, the temperature and the salinity determine the weight of the seawater, the density. The weight of the water determines how the ocean flows, how it overturns. So, heavy water sinks. It's like the atmosphere where light air rises and that drives the convection. The vertical motion of the atmosphere affects the rainfall, the circulation. It's the same thing for the ocean. It's the heavier water that's important. That weight, with heat convection, drives the three-dimensional flow. By knowing the surface salinity you can condition this kind of flow. Without knowing the salinity information, you only have partial information. Scientists have been dreaming about remote salinity sensing for decades. The first paper on it came out in the seventies exploring a theory on how we might use microwaves to measure salinity. So the theoretical work was done thirty years ago. Because the signal is very small, it's very challenging and took about twenty years for the community to sort out how to make all those little corrections and extract a small fraction of the signal being measured. The frequency we use is 1.413 gigahertz in the microwave band. We chose that frequency because it gives us the biggest response to salinity. So, in other words, we found that this is the frequency where a slight change of salinity corresponds to the biggest changes in the microwave signal the Aquarius radiometers can detect. Touching on the practical implications of the mission, how will the information from this and related projects help us to understand the effects of global climate change in both our ocean and atmosphere? If you go to the NASA Website, you will see 15 or 16 satellites already flying which measure different aspects of the Earth's systems: atmospheric, land processes, ice, snow and the ocean. Aquarius is one of the many, yet we are providing this very important piece of information, this missing piece of the puzzle. I couldn't say this is going to be the silver bullet that's going to change everything, right? But this is certainly one of the key pieces of missing information to be added to our database of all known knowledge and to monitor the global changes. The capability of the satellites is global coverage. You don't have to send a thousand ships and all their technicians to the ocean, because every week, the satellite will cover every part of the planet. Salinity is affected by precipitation, evaporation, river runoff, ice melting; so anything related to salt and freshwater will give you a signature in salinity. This is part of the water cycle. In other words, if you are melting more of the snow pack in California, where does the snow go? You can't store it in your backyard; it eventually has to go back to the ocean. When the water goes back to the ocean, you will see the salinity becomes fresher. If the ice is melting, you're going to see salinity changes. Salinity is really an indicator of many of these processes. Aquarius will provide information about the global water cycle, and more importantly, will quantify the change. You can use the salinity changes to infer how much the source is changing. In that way, it's a very powerful data set to be added to the so-called knowledge database. Why did NASA pick Argentina as its partner on this mission? Charles Gay, Deputy Associate Administrator, NASA Science Mission Directorate and Michael Freilich, NASA Earth Science Division Director. What is the nature of NASA's partnership with Argentina? In 1994, CONAE released high-level goals for Argentina's space program that included developing and applying advanced technological knowledge; enhancing economic and human resources; and fostering international cooperation. A major initiative is the SAC satellite series, the fourth of which is Aquarius/SAC-D. For each mission, NASA has provided launch operations and launch vehicles: Space Shuttle (SAC-A), Pegasus (SAC-B), and Delta II (SAC-C and SAC-D). Each satellite was conceived by CONAE and built by the technology company, INVAP, S.E., located in Bariloche. Ground control operations for each mission have been conducted in Córdoba. SAC-A, launched by Endeavour in 1998, characterized the performance of equipment and technologies for future missions. SAC-B was designed to study solar physics and astrophysics using science instruments from CONAE, NASA, and the Italian Space Agency (Agenzia Spaziale Italiana, ASI). Launched in November 2000, SAC-C focuses on Earth observations such as monitoring Argentina's soil conditions and marine ecosystems. Aquarius/SAC-D is the fourth satellite in this partnership. Overall mission design has been developed collaboratively between NASA and CONAE to best meet the goals of each agency while giving priority to salinity measurements. CONAE built complementary sensors to detect rain, sea ice, and wind speed, plus sea surface temperature sampling. CONAE- sponsored instruments - including sensors from the French Space Agency (Centre National d'Etudes Spatiales, CNES) and another from ASI - provide environmental data for a wide range of applications, including natural hazards, land processes, epidemiological studies, and air quality issues. How much did the mission cost? The total mission cost is approximately $400 million. Charles Gay, Deputy Associate Administrator, NASA Science Mission Directorate. How long will Aquarius' mission run? The nominal, or baseline mission, is like the warranty on your car. The engineer can't promise the longevity of the craft beyond a certain period. So, as for reliability, they say the baseline is three years. The team is very confident that most, if not all of the parts, are going to work for at least three years in space. But, nobody is going to throw away a car when the warranty is up. Some NASA satellites last ten, twelve years or more. How is the Aquarius/SAC-D Mission important to everyday citizens of Argentina? Everybody in Argentina has been following the launch of this satellite through public television and other media. The (Argentine) President was present during the transmission (of the launch). Children in schools will be receiving the information from the satellite so it's something that is not only a success or victory or something important for the scientists but it's important for the whole country. It's important to feel how proud we are of something that is sometimes very difficult to understand but that we know that somewhere in our hearts that this is a triumph of a bet that we made many years ago in Argentina. As Dr. Varotto has said, there are dreams that are worth following. Hector Timerman, Foreign Minister of Argentina. Part of the Aquarius project calls for a 2012 deep water project in the Atlantic using ships, smaller craft, buoys and submersibles. Could you elaborate on this? There's a dedicated website describing this as well called SPURS (Salinity Processes in the Upper Ocean Regional Study). That experiment will have two goals. One is to provide more in situ data to help us to compare with Aquarius and more importantly, to collect three-dimensional information at various depths. We have five cruises planned. Each cruise will be thirty days long and will take place in the North Atlantic about 28 degrees north, away from the coast, where maximum salinity in the Atlantic is present. We'll deploy a number of different vehicles, including robotic vehicles, to measure saline concentration in the three-dimensional water column, and then try to understand what controls the change at the surface. Aquarius measures only surface salinity. By knowing the surface changes, we hope to use this field campaign to understand the processes that take place within the water column. So, if we see some changes at the surface, we can anticipate what may be happening at depth. Will SPURS (Salinity Processes in the Upper ocean Regional Study) be conducted only in the North Atlantic? Yes, for the first series. There will be five cruises at the same spot at different seasons. Each cruise is thirty days long. The first cruise will take place in the fall of 2012, with the first series concluding in the summer of 2013. All will take place in the same North Atlantic location. We call it sub-tropical: 28 degrees north, 38 degrees west. You can go to the website for a detailed description. Each cruise will occupy an area a few hundred kilometers by a few hundred kilometers, so we'll have a view of Aquarius' footprint. A lot of information will be collected in that footprint. And even within this designated portion of Aquarius' path, a lot of changes occur such as microclimates and even micro-oceans. We chose that area because it's very salty, around 38 PSUs (practical salinity units). We want to understand what maintains the salty water. That's a simple question. How has the Aquarius spacecraft been performing in the first three years of its mission? Everything's going great. In the first six months, we had a few occurrences where the spacecraft would go into safe mode. After locating and correcting the problem, the spacecraft has been functioning perfectly. Simon Yueh, Aquarius/SMAP Project Scientist, NASA Jet Propulsion Laboratory, September 22, 2014 (Interviewer: Chris Howell). Comparing the ESA craft (SMOS) to Aquarius, how do they differ? In terms of penetration depth, they are the same. SMOS covers a wider swath, 1000 kilometers wide with each pass. While the swath of Aquarius is less wide at 400 kilometers, Aquarius' radiometer is more precise. Also, Aquarius and SMOS are flying at sun synchronous polar orbits, but opposite crossing time at equator. Aquarius crosses the equator from south to north (ascending) at about 6pm local time and from north to south (descending) at about 6am local time, while the SMOS orbit is opposite. Taken together, the information from each of the two craft compliment one another other quite well. Was soil moisture planned as a part of the Aquarius mission, or did it become a plus after the fact? It became a plus in the mission. Soil moisture measurement was known to be a role Aquarius could play, but it was never thought of as the primary mission. Do we have enough instruments in play now, or do we need more to better evaluate the data? Are we missing anything? For the oceans, we always need a combination of in situ buoys, which can either move freely with the ocean current, or be fixed on moorings to the ocean floor. The data from the buoys is always limited to its spatial sampling. It would be unrealistic to have moored buoys throughout the ocean. It just wouldn't be possible. It would be too expensive to do that. And so, the satellite gives us a global view of what's going on. The Aquarius mission has been going along pretty well. And in fact NASA is going to launch a new mission in a few months called Soil Moisture Active and Passive, or SMAP. Earlier we spoke of the Aquarius spacecraft using a fixed dish antenna and three radiometers rather than a single rotating antenna. In those days, 5 or 6 years ago, a rotating antenna presented some problems. Since then, we've developed new technology to build a big antenna that rotates. So this new mission called SMAP has the instrumentation Aquarius has, the radiometer, the radar, but together with that, it also offers a big antenna, 6 meters in fact. The Aquarius antenna is 3 meters, so this will double it, plus, we're going to rotate it. So, this craft will give us a 1000 kilometer swath with a higher spatial resolution of about forty kilometers. So, with a 1000 kilometer swath, SMAP will be able to map the planet, not once a week, but every three or four days? Yes, every three days. And, of course, it will acquire data over the ocean all the time. The primary focus of SMAP is the soil moisture over land. Just like Aquarius, we expect the ocean salinity and the ocean vector wind product will be a plus for SMAP. This will be happening sometime next year. The mission will be launched in January 2015. Starting as early as February 2015, SMOS, Aquarius and SMAP, all operating on the same frequency, will begin working together in concert and should be operating for many years. I think it will be very exciting, very interesting. Speaking of exciting things to come, is there anything on the horizon that really piques your imagination? Spatial resolution and temporal revisit. We're seeing more than just a revolution in technology. NASA is really pushing the technology from smaller to bigger coverage with higher resolution creating even more powerful tools for the scientist. At the same time, we're gaining new insight, even in those areas over the ocean that we thought we understood pretty well in the past. I understand that (Aquarius) is able to collect data that, for over a hundred years, has been collected by buoys, ships, etc. I'm assuming this instrument will collect data in a more accurate and thorough way and in areas that (we) haven't been able to do before. Are the data going to be useful in comparing what the salinity levels have been in the past? Or is it from just this point on that we'll be able to measure salinity since the older methods might not be as accurate? That's an extremely insightful and thoughtful question. Since the dawn of civilization, salinity measurements have been made rather sporadically: at points and intermittently in time, and with varying accuracies. What Aquarius/SAC-D will be doing is making global measurements frequently and with high precision, high accuracy and high stability. There are places in the ocean - particularly in the northern hemisphere - where we have almost enough salinity measurements in the past to be able to continue a "time series" as (the person who asked the question) pointed out with Aquarius/SAC-D. However, over vast reaches of the earth's ocean - especially in the southern hemisphere and the southern oceans - these will be the first measurements. So it's a combination of extending our knowledge and improving those measurements in some areas where we already have "barely reasonable" measurements (and) extending excellent measurements to areas where we have never measured before. Michael Freilich, NASA Earth Science Division Director. Who is using the data collected by the Aquarius satellite and for what purpose? At the moment, it's just being used by salinity scientists trying to understand the measurement itself. It's not quite ready for prime time yet but the reason it's flying is to understand the water cycle on the planet, among other things. In this warming world that we have, the oceans are warming, the atmosphere's warming, there's the idea that the water cycle on the planet will accelerate, there'll be more moisture in the atmosphere, more precipitation, more cycling of water through the system. And the ocean can be kind of integrated gauge for that - changes in salinity can indicate changes in evaporation and precipitation over the ocean. In fact, if you look back over all the measurements that have been made from ships over the last 50 years and you map the changes in salinity you actually find that most of the saltier places in the ocean surface have gotten saltier and the fresher places have gotten fresher, which is exactly the fingerprint that you would think to see in an acceleration of the water cycle. So as Aquarius is coming along ocean scientists are trying to diagnose if this is really true, that there is an acceleration. We have to act like a doctor doing diagnostics on a human, we have to rule out other diseases so what we're trying to do with salinity here is rule out that it's not ocean processes fooling us to make it look like an acceleration of the water cycle. Want to read more from Eric's interview? Click here. Eric Lindstrom, Program Scientist in the Science Mission Directorate at NASA Headquarters in Oceans and Climate Change, Pod Academy, March 22, 2012. Do you have plans to share data between the two groups (SMOS and Aquarius)? Absolutely. The two groups have been working in concert from the very beginning of the development of both missions. We participated in each other's science team meetings. I sat on the SMOS Science Advisory Group for about seven or eight years and we've been sharing information, algorithms, approaches to problems, things like that. There's been a great deal of communication between the two groups and we sort of see each other as one team supporting two missions in a lot of ways. Gary Lagerloef, Aquarius Principal Investigator. Is the data compiled on the satellite and downloaded periodically? How does that data get to earth? That's a very good question: yes, the data is downloaded at a station in Córdoba, Argentina (a little north and west of Buenos Aires). The photo at right shows the ground station. Argentina worked with the U.S. on developing this mission. It's part of a bilateral arrangement between the U.S. and Argentina to co-develop earth remote sensing satellites. Aquarius/SAC-D is the fourth mission that's been developed like this. They have a very sophisticated ground station in Argentina and they have the mission control center for Aquarius/SAC-D, as well. So they're doing all the work to control the satellite and also to download the data. The satellite passes over the Córdoba ground station about four times per day. So consequently, Aquarius has to store its data onboard and we have enough storage to hold about 16 hours of data. Every time the satellite crosses over the Córdoba ground station we download all the memory that's onboard and the next time it crosses over, we download it again. So sometimes we get multiple copies of the same data and during our ground processing we remove the duplications. We also have a backup ground station in Italy so if we miss a pass over Córdoba, we can catch it on the next round when the satellite passes over Italy. This lessens our chances of losing any data. So far since we turned on the Aquarius instrument in August 2011, we have not lost a single bit of data. So we have 100% data recovery up until this point so we're very confident that it's working the way it's supposed to. But to answer your question, we do store the data onboard. We can store up to 16 hours of data; sometime during that 16 hours we have to have a download in order to preserve it. If we don't get it downloaded, then we start to lose some of the data because it gets overwritten. Gary Lagerloef, Aquarius Principal Investigator in How Do We Cover the Globe with Aquarius Data? NASA's Aquarius Studies Our Salty Seas Webinar, January 17, 2012 (Session 2). From what depths will the 2012 Atlantic deep water project gather information from? Some of the robotic vehicles go down to two thousand meters; some of them go down to a few hundred meters. What kind of equipment is placed in the oceans to take readings which can work together with the data to be collected by the satellite? What about animals and tracking mechanisms which travel long distances in the ocean waters? There are a number of ways of measuring the salinity in the water, including tagging marine animals as you mentioned. The TOPP project is just one such example of tagging animals in the ocean. One can also measure salinity from ships, moored and drifting buoys, and profiling floats. There are 3000+ floats that measure sea surface salinity every 10 days, see the project web site to learn more. We need these in situ measurement to calibrate the satellite observations, and verify the proposed 0.2 salinity unit accuracy. How will the (Aquarius) information be released? Once we are through the calibration/validation phase, the data will be released and made available to the public. JPL's data center, known as PODAAC (Physical Oceanography Distributed Active Archive Center), is responsible for gathering the data and publishing it on the website. The digital data, the images, the graphs, everything is public access. It's open to everybody on the globe without restriction. Before releasing the data to public domain, the science team makes sure the instrument is working properly and the information is accurate. That's the calibration/validation phase. Our goal is to release accurate data within a year of the launch. Coming up in the next few months, in early 2012, there'll be a major meeting with all of the science team members presenting their findings. Hopefully, we'll conclude that the data are accurate, then, release it so that everybody can do their own research. Then, the public can then go to the website and access ocean salinity information in their region of interest. I am a graduate student who has been following Aquarius and am quite excited about Aquarius' first ocean salinity map. When will these data be available? On 27-Sep-11, the Physical Oceanography Distributed Active Archive Center (PODAAC) announced the availability of Aquarius Level 2 data. These data should be used for evaluation and validation purposes only as they are still being calibrated and contain uncertainties. There will be frequent calibration and reprocessing updates, replacing earlier versions, for the next several months. Data may be accessed by acknowledging a disclaimer through Aquarius Data Access in which the user agrees to accept full responsibility in how the data are used, and to inform the project of problems and/or results found, as well as publications. Questions may be addressed to PO.DAAC. What was the reason the (Aquarius) satellite was initially built? Gary Lagerloef, Aquarius Principal Investigator and David Le Vine, Deputy Principal Investigator in How Do We Cover the Globe with Aquarius Data? NASA's Aquarius Studies Our Salty Seas Webinar, January 17, 2012 (Session 2). How long did it take to build Aquarius? In the online graphic representing Aquarius, it depicts the three radiometers as red, green and blue, looking something like an early video projector. How did that come to be? Each radiometer is identical. We don't have to fly three. We can fly one. It would just take three times as long to cover the globe. So, think about it. We line up the three footprints, first one, then the second, then the third in a nice configuration. They line up horizontally. So rather than cover a hundred kilometers, now we can cover three hundred, and within a week, we can cover the whole globe. If we were to fly only one, it would take three weeks to cover the whole globe. Three is a nice configuration. We could fly more, but mechanically, it's difficult to arrange. How do you fly five? With three, you optimize the coverage while giving the mechanical engineer less of a headache to configure. The original concept was to rotate the dish. Rather than have a mechanical dish with three radiometers, we would have had one radiometer in constant rotation. That option proved not to be very practical. It would have cost a lot of money, and would have presented a lot of risk. Eventually, we decided to take a more conservative course, utilizing three radiometers for the configuration. That was optimal. These studies took a few years before we were ready to begin the project. You discussed how there are errors in detecting the radiation emitted from the ocean used to determine ocean salinity. How do the radiation signatures from the ocean differ from those of the galactic background and other error sources? Good question. We model the sun and galactic radiation very accurately, and remove them from the signal the satellite receives. We develop a complete error model for every source. What is the orbital altitude of Aquarius? The average altitude of Aquarius/SAC-D is 657 kilometers (408 miles) at the equator. Can you tell us about the instrument-calibration process once the craft reached its designated orbit? Once you start turning on the instruments, there are a number of different calibration processes to complete. There are the orbital parameters and the pointing of the instrument. You want to make sure you're pointing in the right direction, and to calibrate the antenna patterns and the antenna temperatures. All of this is first tested on the ground and in the lab. Then, in space, we have to make sure everything functions the way it was designed to. So, calibrating the stability of the radiometer is still ongoing at this point with less than a month of the data sets in. The first of the data sets began to come in almost a month into flight, around 21 July 2011. Now, we want to take a little more time and better understand how the instrument works. Once we finish the calibration, then we start the validation. We have many independent surface measurement sources to verify calibration. Salinity readings taken by ships, buoys, robotic vehicles, and drifting vehicles in the ocean are vital to the process. With their conductivity sensors, they measure salinity at the surface, and then we compare the two. One is touching the water and one is four hundred miles in space. We are still in this calibration phase and working out some issues. Yesterday was our "first light" (Aquarius completed its first global mapping on Sept. 23, 2011). There are still some issues we need to work out. We need to understand the scatterometer data better. In first light, we only used the information from the radiometer. We're still working to calibrate the scatterometer so we can better utilize all the information. There's a variety of information you can feed into the retrieval program. So right now, we call it quick-look processing. Can you say more about the spacecraft's orbit tracking just inside the nightline of our planet as it spins on its axis? We fly a so-called "terminator" orbit. Basically, we follow the sun by flying the boundary between day and night. This way, the spacecraft can collect solar energy while the instrument looks at the dark side of the planet, allowing us to minimize the "noise" caused by sunlight reflecting off the water. On the night side, the only thing reflecting off the water is the light from stars and galaxies, making it much easier to work with. How fast does Aquarius go around the Earth? It takes 96 minutes to make one orbit. Do you have any idea how fast that is in miles per hour? It's going 4.2 miles per second; that's very fast. It's about 25,000 miles to circle the earth and we do it in 96 minutes that is about an hour and half so it's something like 15,000 miles per hour. Can you explain "brightness temperature"? What we're measuring is natural radiation from the ocean surface. Everything has energy because it's not at absolute zero temperature and thus gives off radiation. An example of that is night vision. The military is able to see people at night not because they look at light but because they look at infrared radiation. The people are giving off energy at lots of frequencies. One of those (frequencies) is slightly below the optical and is called "infrared" and we use night vision to see that. Another example of natural radiation is the heating of your electric stove. You turn on the burner, it warms up, and it glows red because it has gotten more energy and the added energy changes its frequency distribution. Now because it's so hot, it actually gives off more energy in the optical frequencies that our eyes are sensitive to. But it is also putting off radiation at all frequencies. So if we looked at it with night vision, then it would be overwhelmingly bright. And if you looked at it in the microwave frequency range (e.g., 1.41 GigaHertz, GHz like the Aquarius instrument measures), it would also look very bright. So it's giving off energy. We talk about that energy as an equivalent temperature. So you can say that if the temperature is higher, there is more energy and if the temperature is lower, then there is less energy. The scale isn't so important because it depends on the frequency (e.g., the same temperature scale wouldn't work for the night vision scale at the infrared frequencies). But we have a scale called "Brightness Temperature" that is measuring the amount of energy that's being given off by the ocean surface at a fixed temperature. So in the graph above right (click image to enlarge), go along the horizontal axis and stop at a sea surface temperature (SST) equal to 20 degrees Celsius (see blue box). If you go up to the blue line labeled "12 psu" (practical salinity units, psu), you'll see a purple arrow. If you read across to the vertical axis (i.e., follow the purple dashed line to the left), you see that lower salinity water gives off higher energy because the Brightness Temperature is about 104. At that same SST of 20 degrees Celsius, higher salinity water (see red arrow at 42 psu), gives of relatively lower energy (i.e., follow the red dashed line to Brightness Temperature on the vertical axis at about 88). Aquarius has a very precise instrument that tells us how much energy is coming off the ocean surface and we express that as a "Brightness temperature". If the brightness temperature is higher, then the seawater is fresher (i.e., less salty; see pruple arrow / dashed line above). If the brightness temperature is lower, then the seawater has more salt (i.e., red arrow / dashed line). The graph shown at right was published in 1977. So an important new area of research is to develop a set of curves that are very carefully calibrated so we know exactly what energy corresponds to what salinity. And the instrument we use is very precise and makes these measurements accurately and consistently. David Le Vine, Deputy Principal Investigator in How Do We Cover the Globe with Aquarius Data? NASA's Aquarius Studies Our Salty Seas Webinar, January 17, 2012 (Session 2). As far as the Aquarius technology is concerned: Is this something that could have been done five years ago? Ten years ago? The microwave L-band radiometer plus the scatterometer that is used in the Aquarius instrument are far and away the most accurate and precise and stable instruments of their type that have ever been flown in space. This really could not have been done ten years ago. In terms of exploration of other planetary systems, can Aquarius's technology be applied to looking for salt elsewhere in the solar system? We also have a backup ground station in Italy so if we miss a pass over Cordoba, we can catch it on the next round when the satellite passes over Italy. This lessens our chances of losing any data. So far since we turned on the Aquarius instrument in August 2011, we have not lost a single bit of data. So we have 100% data recovery up until this point so we're very confident that it's working the way it's supposed to. But to answer your question, we do store the data onboard. We can store up to 16 hours of data; sometime during that 16 hours we have to have a download in order to preserve it. If we don't get it downloaded, then we start to lose some of the data because it gets overwritten. The European SMOS mission has been trying to measure ocean salinity over a year. The mission has had issues as a result of radio frequency interference (RFI), not just soil moisture but over the oceans as well and no doubt you're going to encounter that experience too. Your thoughts on Aquarius and RFI? That's a really good question. There are a couple of things to say about the SMOS mission and how it differs from Aquarius. First of all, SMOS stands for Soil Moisture & Ocean Salinity; it's a dual science mission. The primary science drivers for how that mission was designed were focused on measuring soil moisture. That's why the SM comes before the OS in the name of the mission. And it was always viewed as a kind of an experiment to see how well we could do salinity with it because the design is not idealized for ocean salinity. What we did differently with Aquarius was really focused on ocean salinity and what the measurement requirements were there in terms of accuracy, calibration, stability, and spatial and temporal resolution that we thought were the key science objectives. So, the other factor is that SMOS employs a thinned aperture, phased ray design which is much more difficult to calibrate than Aquarius is going to be and so they're running into some of those problems. With regard to the radio frequency interference issue that you mentioned - that has plagued SMOS. They've done a lot of work on dealing with some of the emitters, particularly in northern Europe. Aquarius actually anticipated this problem and one of the other technological factors that went into the design of the Aquarius instrument was that we have actually tested and built an RFI filter using measurements that we've taken from rooftops and other places to see what the characteristics of that radio interference would be. So we built a filter into the processor - it hasn't been tested from space yet - but we think we'll have sort of a leg up on that problem once we get on orbit. How does the scatterometer work? The radiometer is a passive instrument collecting radiation emitted from the planet's surface. The scatterometer, on the other hand, is an active radar that measures the "roughness" of the water caused by waves and swells. It sends a pulse to the ocean's surface to measure the reflectance. If it's a perfect mirror, you get a perfect reflection. The spacecraft uses the same dish antenna for both instruments, combining the two separate signals from the radiometer and the scatterometer to produce an accurate measurement. Does cloud cover interfere with the measurements? When the mission is complete, will Aquarius be removed or continue to orbit around the earth? Aquarius was designed to map surface ocean salinity covering a path 400 kilometers wide. For soil moisture readings, I understand that reading a narrower swath provides greater accuracy. The three antenna field covers a total width of about 400 kilometers. Each of the radiometers had a different coverage width, 150, 120 and 80 or 90 kilometers. Can the data from a single radiometer be accessed for a narrower path reading, or is the data combined and sent back as one signal? Each of the radiometers provides its own signal. The three separate readings can be thought of like ski tracks in the snow, recorded simultaneously as the spacecraft passes overhead. Combined, the total width of each pass is 400 kilometers. Taken separately, each instrument covers a path ranging from 150km to 90km. The data from each separate path has been used to produce soil moisture reading with varying width. With Aquarius now being used for soil moisture measurement, is it still able to conduct ocean surface salinity mapping, or did it need to be recalibrated for the soils mapping mission? Aquarius is acquiring data all the time, regardless of whether it's flying over land or water. The data from the ocean is read as ocean salinity, while the data over land can be interpreted as soil moisture. We cannot obtain the soil moisture reading if the ground is covered by snow or forest. How does the Aquarius satellite measure salinity from space? Salinity is normally measured from a ship. We measure the conductivity of seawater. Well, we can get a estimate of the conductivity of the seawater from space. As the conductivity changes, the microwave emissions change and we put a very sensitive radiometer in space that measures the microwave emissions from the sea surface and we can back that out into a salinity estimate. It's a very daunting remote sensing measurement. We have to have a very sensitive radiometer and we have all sorts of conflicting issues: the roughness of the surface, the temperature of the surface, the galactic background radiation. Want to read more from Eric's interview? Click here. I understand that salinity measurements from space are a first for NASA. Why do this now? What brought on the importance to take (these measurements) from space? The key to understanding the earth is not simply to understand individual processes but rather to understand their linkages. Surface salinity in the ocean provides linkages and understanding of a number of different cycles in the earth. If we want to understand the water cycle of the earth, we have to understand things like evaporation and precipitation; that is, the water moving from (the land and) the ocean to the atmosphere...and coming from the atmosphere back to the ocean. When you rain on the ocean, you change its salinity: the surface salinity becomes less. When you evaporate water from the ocean, you change its salinity: the surface salinity becomes greater. When you freeze (ocean) water into ice, the ice rejects the brine (i.e., salty water) and the salinity of the surrounding ocean increases. So the point of making those measurements today is that they help us to elucidate so many different aspects of the coupled processes that define the earth as a system. Furthermore, the deep circulation of the ocean is driven by density differences: heavy water sinks, lighter water floats. The salinity content of the deep ocean - of the subsurface ocean - is a big part of determining the density of those waters. So if we are to understand subsurface currents, we need to understand surface salinity because it's at the surface where the "imprint" of salinity is placed on the water. It really ties together a lot of things. It is an extremely timely mission. Are there any specific theories or predictions that the science community would like to prove about salinity, or is this more of a fact-finding mission? There are two types of objectives for the Aquarius mission. The first objective is about discovery. As you said, this will be a fact-finding mission. In those places where ocean salinity was never measured, Aquarius will find something new and interesting. The second objective is about salinity science, including the global water cycle, the ocean's circulation and its role in climate. How much does ocean salinity vary with depth? Can Aquarius measure salinity at different depths? Salinity changes a lot as you go deeper into the ocean. The satellite can only "see" the ocean surface, a very thin layer around a few centimeters. Why does freshwater give off more energy than saltwater? It's a little bit complicated in engineering terms but I'll see if I can make this clear: conductivity is what makes currents flow. So something that has good conductivity, like the wires in your house, conduct electricity very well. If something has poor conductivity, like a glass window, it doesn't conduct electricity well at all. It turns out that the saltiness of seawater increases its conductivity. That conductivity suppresses the energy that's emitted from the ocean surface. Actually, what happens is that (the energy) bounces off the surface and back into the ocean; so the more conductivity, the more energy is retained (i.e., bounced back into the ocean). How much salt is there in the world's oceans? Probably more than you think. Some scientists estimate that the oceans contain as much as 50 quadrillion tons (50 million billion tons) of dissolved solids. If the salt in the sea could be removed and spread evenly over Earth's land surface it would form a layer more than 500 feet thick (152.4 meters), about the height of a 40-story building. Seawater is 220 times saltier than fresh lake water. Unrefined sea salt contains 98.0% sodium chloride and up to 2.0% other minerals (salts). Together there are over 100 minerals, composed of 80 chemical elements, in sea salt. The composition of a single crystal of ocean salt is so complicated that no laboratory in the world can produce it from its basic 80 chemical elements. Herbert Swenson, US Geological Survey in Why is the Ocean Salty? A defining characteristic of ocean water is its relatively high concentration of dissolved salts or salinity. Understanding why the sea is salty begins with knowing how water cycles among its physical states: liquid, vapor, and ice. As a liquid, water dissolves rocks and sediments, and reacts with emissions from volcanoes and hydrothermal vents: this creates a complex solution of mineral salts in our ocean basins. In other parts of the cycle, however, water and salt are incompatible: water vapor and ice are essentially salt free. Through Earth's history, certain processes - including weathering of rocks, evaporation of ocean water, formation of sea ice - have served to make the ocean salty. These "salinity raising" factors are continually counterbalanced by processes that decrease salinity such as the continuous input of fresh water from rivers, precipitation of rain and snow, and melting of ice. Seafarers through history have discovered that Sea Surface Salinity (SSS) varies from place-to-place: SSS in the open ocean generally ranges between 32 and 37 psu, but may be much lower near fresh water sources or as high as 42 in the Red Sea. Between 300 and 600 AD, awareness of changes in salinity, temperature, and smell helped Polynesians explore the southern Pacific Ocean. In the 1870s, scientists aboard H.M.S. Challenger systematically measured salinity, temperature, and water density in the world's oceans. Over the years techniques for measuring such ocean water properties have changed drastically in method and accuracy. Aquarius is a NASA Pathfinder mission that provided a new type of SSS measurement through an innovative use of technology. Although everyone knows that seawater is salty, few know that even small variations in SSS can have dramatic effects on the water cycle and ocean circulation . This is why long-term, accurate, global maps of SSS - such as those to be delivered by Aquarius - are crucial to climate studies. How much salt is there relative to water? Yes, there is a lot of salt in the ocean, but there is a lot more water. In ocean waters of average salt content (35 psu), the weight of water is over 28.5 times greater than the weight of salt it contains. Oceanographers use the measure of salinity to describe the relative amount of salt to water. Is salinity uniform throughout the ocean? No. Although the amount of salt in the ocean is relatively constant on time scales of years to decades, sea surface salinity (SSS) varies because freshwater input & output - part of the global hydrologic or water cycle - varies from place-to-place. The large scale pattern of evaporation and precipitation is established by Earth's atmospheric convection cells. In the simplest case - for example, if Earth were covered by oceans and not spinning - the atmosphere would move heat between the hot tropics and cold poles in a very simple way. Hot air would rise along the equator, creating a band of low atmospheric pressure. 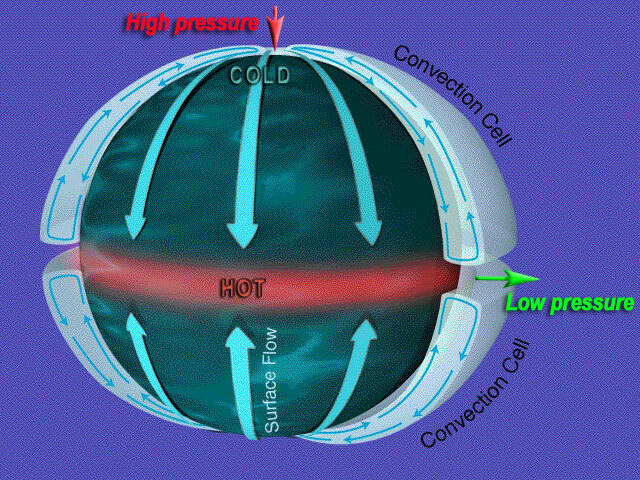 Cold air would sink at the poles, creating regions of high atmospheric pressure. The presence of continents and Earth's rotation complicates the idealized "two cell" system. 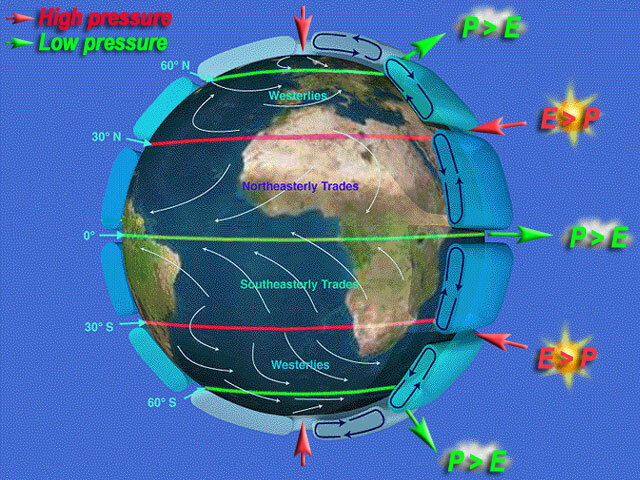 A fairly realistic model of Earth's atmospheric circulation consists of six cells: three on each side of the equator. This pattern has atmospheric pressure highs at the poles, 30°N and 30°S. It also has atmospheric lows along the equator, 60°N and 60°S. Away from the poles, cloudiness and precipitation (P) dominate bands of low pressure: these latitudes host the world's rainforests. Dryness and evaporation (E) dominate bands of high pressure: these latitudes are home to deserts. In terms of SSS, lower salinity generally occurs where precipitation is greater than evaporation (P>E). Higher SSS generally occurs where evaporation is greater than precipitation (E>P). Compare the "six cell" model with the map of global average SSS (image upper right). 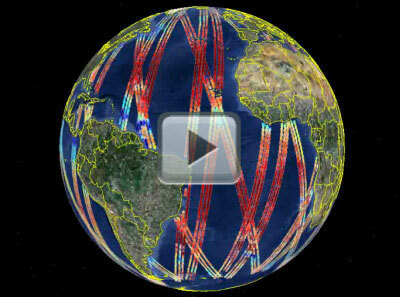 How well do SSS patterns mirror bands of high and low atmospheric pressure? In places where they do not match, what other types of freshwater inputs & outputs might be occurring? Why do you think that the Atlantic Ocean has a higher salinity content than the Pacific Ocean? The Atlantic experiences a higher amount of evaporation; the same is true for the Mediterranean Sea, where salinity is as high as 37-39 PSU. Why are salt levels in the oceans and lakes so different? The sea is salty and lakes pretty much contain only fresh water and very little salt. The reason for that is, over geologic time, as rivers erode the land and carry minerals to the sea, some of those minerals accumulate in the seawater and build up over time. These minerals make up what is called "sea salt". There is a more complicated chemical balance between what is dissolved in seawater and what gets absorbed by the ocean sediments but, over time, it has reached an equilibrium and the saltiness of the oceans has remained relatively constant for hundreds of millions of years. So if you were to go back in time to the earliest days of the dinosaurs and you took saltwater samples, it would be pretty much the same salinity as we observe today. So it is a very complicated chemical balance that maintains the ocean salinity the way it is. But the water in lakes doesn't accumulate minerals to the same degree because, first of all, they haven't existed as long (as the ocean basins) and the chemistry of lakes is different. Does that mean freshwater lakes have not been in contact with the substrate (underlying rocks) for as long as the ocean? That could be part of the answer but because the oceans are so vast there's a much bigger chemical process going on than in a lake. And there are also some lakes that are extremely salty, for example the Great Salt Lake. For various reasons because of the nature of the minerals that feed into the lake, the amount of evaporation that goes on in the lake and because the Great Salt Lake is in the desert, water flows in and then evaporates away and leaves the residue behind. Whereas in lakes like the Great Lakes there is more of a turnover in fresh water: the water flows in and goes back out again so there is a flushing. The water eventually makes its way to the Saint Lawrence River and to the ocean. So the Great Lakes get flushed through and the salt doesn't accumulate. In the Great Salt Lake there's no outflow (i.e., the water flows in from a river and then evaporates into the atmosphere and leaves the salt behind). This is the same reason why the Dead Sea is very salty. With large eruptions of volcanoes, would those have direct correlations with salinity particularly along streams or water outflows? There are two potential ways to look at your question. I don't really know how much of an interference of our microwave frequency signal that we would see from a volcanic eruption. We do know that when there are large volcanic eruptions, it certainly throws off infrared frequency measurements from space because the dust and debris get injected into the stratosphere and creates a horizontal cloud that obscures some of the infrared light. But I think that microwave energy (that Aquarius measures) will pass right through so I don't think it will actually affect our measurement. But its impact on the ocean is going to less direct. It will impact the temperature over the long run because it will shield some sunlight and therefore affect the temperature that, in turn, could affect the interaction of the ocean with the atmosphere to change rainfall patterns that would affect salinity. This is because salinity is directly tied to rainfall and evaporation off the sea surface. There wouldn't be any near-term effect but there could be long-range effects associated with volcanic eruptions. But I don't think a volcano is going to have any direct effects on sea surface salinity. With fourteen orbits per day over three years, especially at the tropical latitudes, will you be able to pick up information on the biological thresholds of organisms related to salinity? That's an interesting question. The important thing to understand about marine biology and what affects life in the ocean such as primary productivity is that the saltiness of the water doesn't have much direct effect on sea life. Marine organisms can live pretty much at any ocean salinity. What really governs the concentration of biology in the surface waters is the availability of nutrients and that depends on ocean circulation. The salinity, however, can be a tracer of different water masses, some of which are nutrient-rich and some of which are nutrient-poor. In the coastal areas, there tends to be river water flowing out that can be rich in nutrients. We can also have coastal upwelling that can bring nutrient-rich water from the deeper ocean to the surface; these areas will have surface salinity signatures that we can observe with Aquarius that will help tell us where those nutrient-rich waters are. But it isn't the salinity itself that governs the biological productivity; it's actually the availability of nutrients. In terms of Earth's changing climate, I've read that ocean events known as El Niño and La Niña actually begin in the region of Indonesia during monsoon season. How do these events affect ocean salinity? El Niño begins in the western Pacific where major rainfall changes occur. That, presumably, will have a salinity signal. One of our science questions is to quantify this. We anticipate that Aquarius will be able to see El Niño/La Niña signals, but we'll need several years time to compare our data. Has new insight (gained from Aquarius data) anything to do with a better understanding of the dynamics of surface and subsurface currents and how they function? I think with the information we are now learning from Aquarius, we are learning to go back and re-assess, to re-evaluate the role of vertical mixing and horizontal advection in the ocean dynamics. So, even for a region we think is dominated by evaporation, or for some reason, dominated by precipitation, now the general picture is we can only grasp these as hypotheses. Horizontal advection, vertical mixing, evaporation, precipitation, all these play an important role at different times, at different scales and resolutions. For example, another very interesting science phenomena discovered by Aquarius is what we call the tropical instability wave across the Pacific and the Atlantic. This is a new discovery by Aquarius. That kind of information has been seen in the past in the ocean surface temperature images a few degrees north of the equator. But Aquarius is providing a new picture of information that, these kinds of waves also exists near the equator, but can only be seen in the salinity data set. The other example is the river outflow. Standard thinking has been that the fresh river outflow from the Mississippi River would only affect the coastal region near Texas, Mississippi and Louisiana. The Aquarius data has now shown that the fresh water on the surface can reach all the way to the southern end of the Gulf of Mexico. In the winter, when there's not much precipitation in the region, then in the summer when there is precipitation, we can see that salinity cycle in the upper ocean through the Aquarius data. Another example I'd like to tell you is pretty interesting, it's something that we've just started to understand. It's a combination of how useful it is to combine the whole motion image salinity together. One of the interesting regions for the oceanographer or the climate scientist is the ocean surrounding the Indian Subcontinent. Why is that region so important? They have a monsoon season, right? In September, they get a lot of rain. Then, in the Indian sub-continent, around Tibet, they also get lots of snow. So the heavy precipitation and river run-off dump vast quantities of fresh water in the Bay of Bengal. We also have heavy precipitation over the open ocean in the same region. When we start to look at the soil moisture changes over the continent, and the salinity changes in the ocean, we can see their time correlation. Then, we can see when the fresh water will actually reach the southern point in the Bay of Bengal. But there's something else, more than just the fresh water coming into the Bay of Bengal. There's also a current in the Bay of Bengal, and that current can change direction in winter and summer. So, we can see how everything plays together, with fresh water coming out of the Bay of Bengal, and then the ocean current actually moving the fresh water around. A region in the North Atlantic known as the Sargasso Sea is said to have the highest salinity of any of the world's oceans. Referred to as a desert on the ocean, does the Sargasso help us to understand how the process of desertification takes place on land? This area, the Sargasso, was first investigated by NASA two years ago in a study called SPURS (Salinity Processes in the Upper Ocean Region Study). What's interesting is that when the SPURS data is analyzed in conjunction with the data from Aquarius, the conclusion is the ocean is much more dynamic than scientists had thought in the past. So, it's not really a desert. There are a lot of activities going on in the region. It was thought, in the past, that because the region is dominated by high evaporation and so little precipitation, no rain in the area, the salinity should follow the evaporation pattern pretty well. But then it turned out that, that's not really the case. It's what we call horizontal advection, and also, vertical mixing. Horizontal advection corresponds to the ocean current redistributing waters of different salinities horizontally. Vertical mixing is the exchange of waters at different depths with different salinities. Earlier in our conversation you mentioned fresh water outflow from rivers. Near the equator the river that produces the greatest outflow is the Amazon. What we're seeing now is that the outflow from the Amazon River can affect (the ocean salinity for) more than just a few hundred kilometers. We found that sometimes, large pockets of fresh water from the Amazon can break free, follow the current across the Atlantic and move towards Africa. This is really amazing. The thought has been that when the fresh water From the Amazon comes out, it would mix quickly with the ocean within a few tens of kilometers or maybe as much as a hundred kilometers. But it's more than that. Now, we're seeing that the ocean can carry that fresh water pocket for a much longer distance. What do you think may be causing these pockets of fresh water to hold together? We don't know. It's pretty interesting. This is something for the scientists to ponder. There's a lot of information that still missing. So, this is an area in which we're still learning. You noted that freshwater outflow from the Amazon has been found to travel a great deal farther into the Atlantic than had been thought, at times reaching almost to the African Continent. Do fresh water pockets from rainfall hold together in a similar way to those of fresh water outflow from large rivers such as the Amazon? In the tropics, in the Pacific and also the Atlantic, there are what we call inter-tropical conversion zones. These zones occur near the tropics where wind develops between the northern hemisphere and the southern hemisphere. In the Pacific, this region produces more rain, more precipitation, than the Atlantic. The traditional thought, before the Aquarius mission, was that when the fresh water comes down as rain, it would form a fresh water layer on the surface, then mix very quickly, vertically, with the ocean. If this were the case, we should not see a fresh water layer on the surface for too long. The speculation from the Aquarius data is that it has to do with local wind conditions. When the surface is calm, when the wind is low, the fresh water layer can stay longer. Then, when the wind is stronger, the vertical mixing will be more rapid. In the global water cycle, is "salty" good? There's no such thing as absolute good or bad, right? In certain areas, you want to monitor the change, that's really the key. You want to see whether the area's freshwater gets fresher, you know, and if the salty water gets saltier. That represents the speeding up or slowing down of the water cycle. So you ask the questions: do we have more evaporation as we change the climate? Do we have more freshwater melting? All these questions are related. Why does the Atlantic have more evaporation? Mostly due to the land-sea contrast (located between two major continents). It is also smaller than the Pacific. Since the Aquarius mission has been active, what insights have been gained to better understand the planet's water cycle and changing weather patterns? There are quite a lot of interesting discoveries the science community has been finding from the Aquarius data over the ocean. The dynamics involving fresh water from precipitation and how it mixes with upper layers of the ocean is of special interest. Aquarius measures salinity at the surface. We also use ocean buoys, but readings use conductivity sensors to measure salinity at a depth of about five meters, a depth at which algae is less likely to grow. We know that the surface layer, aerated by wave motion and carrying warm water in the tropics, is conducive to algae growth. Sensors placed closer to the surface would become fouled with algae and no longer function. At a depth of five meters, algae growth is discouraged, the increased salinity at depth acts much the same as chlorine would in a swimming pool. The ever-changing salinity dynamic in the top five meters of the oceans has recently become a topic of great interest to oceanographers and climate scientists. Its understanding is now seen as a key factor in predicting weather patterns and changing climate. Does the salinity of the seawater have any correlation to global warming? In the changing climate as the temperature increases, there will be a lot of ice melting, so the salinity will decrease, in other words become fresher. Over the past 50 years, we already see a dramatic freshening of North Atlantic water, so global warming will have a signature in ocean salinity, that is why we want to measure it from space. Do you think the Aquarius data will influence industrial behavior? I wouldn't expect immediate changes. All of these climate data sets need a long record. You can't use something changing from today to next year, or even two years from now, to infer something magically is evolving, right? I hope Aquarius' data sets eventually will have a strong impact on policy. An example would be the famous Keeling Curve where we've seen how atmospheric CO2 is changing in Hawaii over a period of fifty years. When started in the '50's, the scientist from San Diego (David Keeling of the Scripps Institution of Oceanography) never thought "that's a powerful curve", that it would be named after him, and the enormous impact it would have on policy. It may take a decade or more to accumulate enough accurate data, then to understand the trend and eventually influence the policy makers. JPL/NASA has a small fleet of Earth Science spacecraft engaged in climate studies. Is Aquarius working in concert with other craft as well to gather data on the planet's water cycle and shifting climate? There is another mission launched by the European Space Agency in 2009 known as SMOS, the Soil Moisture and Ocean Salinity mission. The key focus of the mission is soil moisture followed by ocean salinity. When the mixing becomes more rapid and the convection currents increase does that affect the weather pattern? There is a recent study that indicates that this could be the case. A group of scientists have looked at data from Aquarius and SMOS taken over the Amazon river plume in the western tropical Atlantic during the time of hurricane Katia.